Over the past 20 years, Chris and Shelley Riley have been involved in breeding high quality, well socialized animals. Originally, we started breeding Golden Retrievers that excelled in both breed and obedience rings, producing many champions. As exciting as show competition is, our true passion was breeding well mannered Goldens that brought a great deal of pleasure to families across the U.S. In 1996, we purchased an early 19th century farm in Westport, Massachusetts where along with Golden Retrievers, we hand raised very social, exotic deer. The advantage of "bottle-raised" deer is their friendly nature towards people. It allows for rare, face to face interactions with a normally hard to find, rare animals. Hand raising deer has been a tremendously satisfying experience for us. 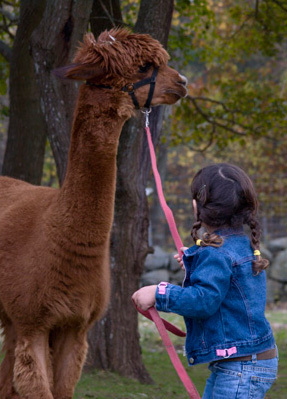 Our passion for raising and caring for animals, quickly drew us to Alpacas. Alpacas are a member of the camel family and are often confused with small llamas. Unlike the llama, Alpacas are extremely social, completely non-aggressive and produce the finest wool known to man. Alpaca Fiber is often compared to cashmere and is used exclusively in the luxury apparel industry. As an investment, Alpacas are ideal for people who love animals and are drawn to a lifestyle which offers less stress and more personal satisfaction. You do not necessarily need to have experience with live stock. Although alpacas are not inexpensive, they offer tremendous tax advantages, while requiring very little effort in their care and maintenance. Alpaca Farms qualify in many states for significant real-estate tax breaks for agricultural based businesses. Alpacas, unlike other investments, are insurable and the cost of each animal can be depreciated over 5 years. Most importantly, Alpacas possess a certain temperment that gives the animal an unmatched level of charisma in comparison to other types of livestock.